QNAP Systems, Inc. today unveiled new TVS-882BR RDX models (including the TVS-882BR-RDX and TVS-882BRT3-RDX) that integrates the Tandberg RDX QuikStor internal SATA 5.25-inch docking station (8813-RDX) for installing removable and portable RDX hard disk cartridges. Compared to standard external hard drives, the Tandberg RDX cartridge features a rugged dust-proof design that protects data for a longer period of time and allows users to easily transfer data with the cartridges. Users can access and manage files on RDX cartridges using File Station and activate automatic file organization using Qfiling. 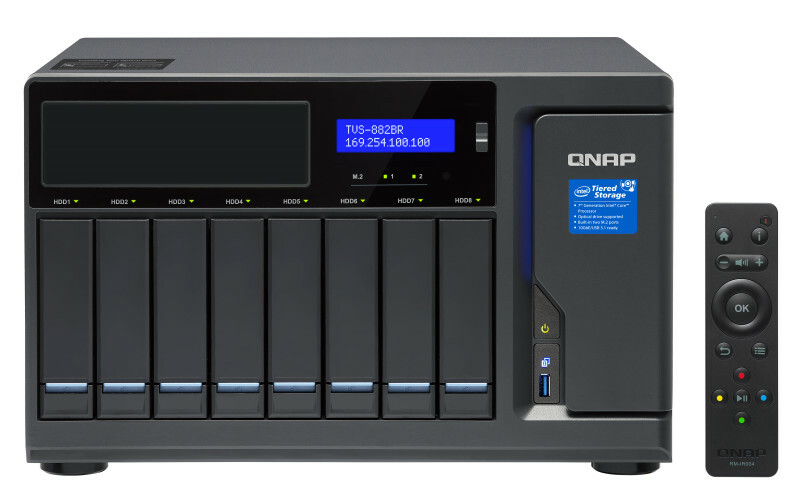 Hybrid Backup Sync provides a complete backup/recovery solution, allowing users to back up or sync files to another NAS or to cloud storage which seems increadibly handy and I personally would like to get my hands on one. 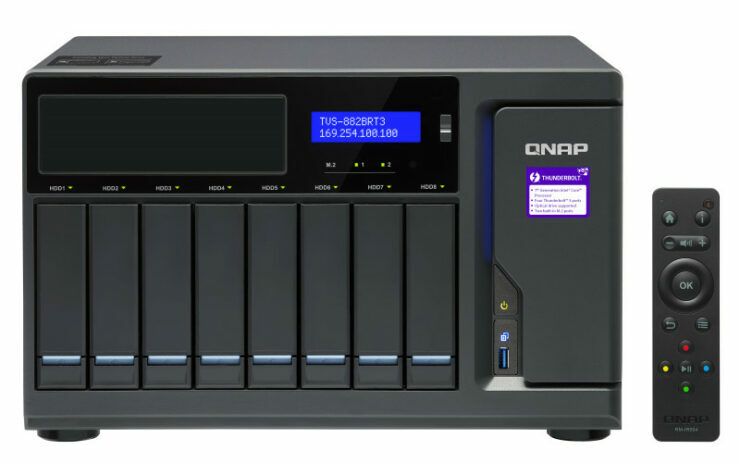 Also QNAP’s proprietary search engine Qsirch also allows users to quickly find needed files using various search methods. Powered by 7th-Generation Intel multi-core processors (Core i5, i7), DDR4 2133 MHz RAM (upgradable to 64 GB), four Gigabit Ethernet ports, and SATA 6Gb/s HDD interface, the TVS-882BR series delivers up to 447 MB/s read/write speeds and up to 443 MB/s read/write speeds with Intel AES-NI encryption. With three PCIe Gen.3 slots (the TVS-882BRT3 features two pre-installed 2-port Thunderbolt 3 expansion cards), the TVS-882BR allows for adding a 10GbE/40GbE network adapter, QM2 expansion card, SAS storage expansion card, or a USB 3.1 10GbE adapter, making it ideal for wide range of storage applications. Users can enjoy improved system performance with Qtier auto-tiering technology and SSD caching with two M.2 SATA 6Gb/s slots. Equipped with four Thunderbolt 3 ports, the TVS-882BRT3 provides 40 Gbps bandwidth and Thunderbolt-to-Ethernet (T2E) 10GbE connectivity, providing media professionals with an ideal collaborative platform for media production. Tower model; 7th Gen. Intel Core processor (burst up to 4.2GHz), 9th Intel HD Graphics dual-channel DDR4 2133 MHz RAM (user upgradable to 64GB); hot-swappable 2.5-inch/3.5-inch SATA 6Gbps HDD/SSD; 4 x Gigabit RJ45 LAN ports; 3 x HDMI v1.4b, up to 4K UHD; 5 x USB 3.0 Type-A ports; 1 x PCIe Gen.3 x8 slot / 2 x PCIe Gen.3 x4 slot (TVS-882BRT3 pre-installed with 2 x dual-port Thunderbolt 3 cards); 1 x speaker, 2 x 6.33 mm microphone jacks (supporting dynamic microphones); 1 x 3.5mm Line Out audio jack.